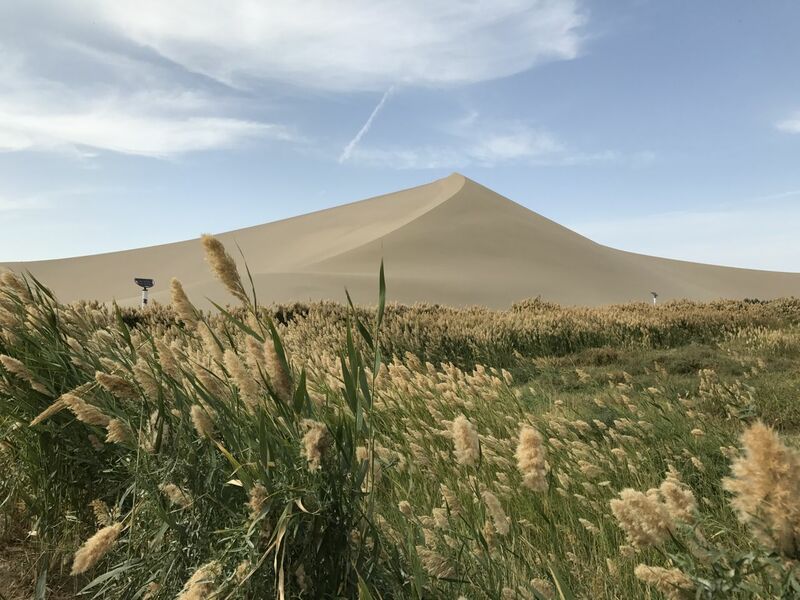 China has a lot of different geographical terrain, and while Gansu province has some lush green areas thanks to land being near the Yellow River, there are other areas that seem very parched to the point of becoming desert. One such spot along the Silk Road is the Singing or Echoing Sand Mountains about 5km from Dunhuang. When we reached the site it was literally desert with sand dunes. Some of our fellow travelers came prepared wearing masks -- they were worried about possible sand storms, and the mountains get the name singing or echoing because when the wind blows the sand here, it makes an eerie sound apparently. But the day we went the weather was perfect -- not too hot -- though a hat helped shade from the sun, and there was a gentle breeze. The tourist site sold bright orange tall boots to cover people's feet from getting sand in them, but we decided it wasn't necessary. 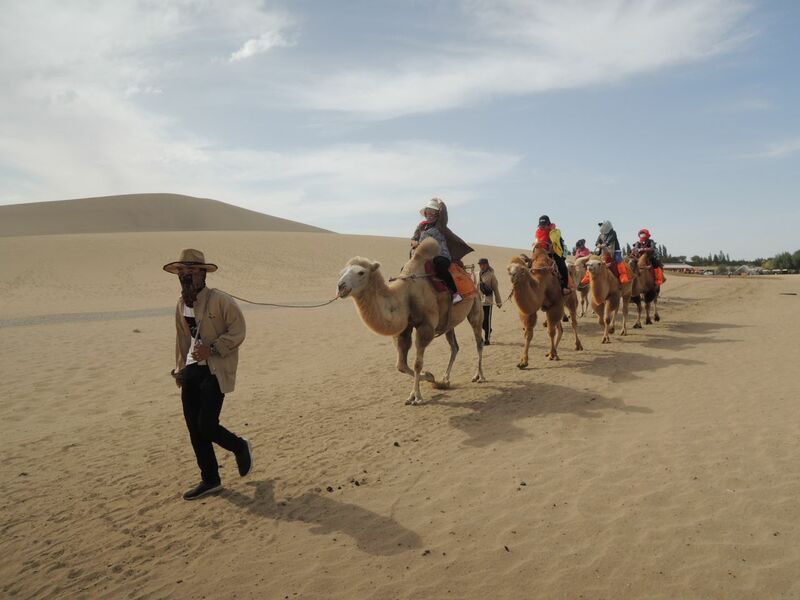 Lots of local tourists were taking camel rides at 100 kuai each, and with each guide leading four to five camels strung together, that was big business, as there was a non-stop stream of camels walking along the sand. Meanwhile there were others who climbed up a giant sand dune, much like hiking up a snow mountain and then riding a sled down the sand slope. It seemed like a lot of work for about 20 seconds of fun. The site also has a walkway so tourists won't get sand in their shoes. My aunt and I chose to walk the 1km route and along the way we saw lots of greenery amid the desert, which was man made. The washrooms here were very clean -- they even had soap and toilet paper! When we came out we admired the nearby fruit trees and saw they had fruits on them. They were small, but too tempting to pass up, so I climbed up a pear tree and managed to pick seven or eight of them! I tried them afterwards and they were quite sweet! The path we walked along led to Crescent Moon Spring -- it really is that shape and interestingly has never been covered up by the sand. 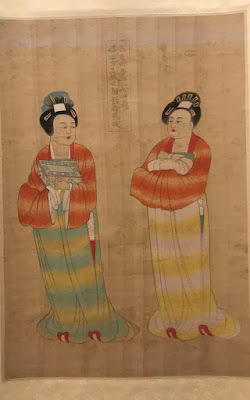 Visitors along the Silk Road would stop here for a drink -- it definitely was not a mirage. 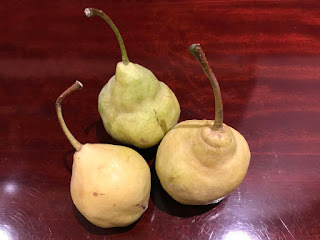 Three of the small pears I picked from the tree! Today there are gift shops and refreshment stands near Crescent Moon Spring... the modern version of freshening up. We walked in the sand for a bit, and it was very fine, soft and warm from the heat of the sun. What an interesting experience, seeing sand dunes, camels and picking ripe pears.